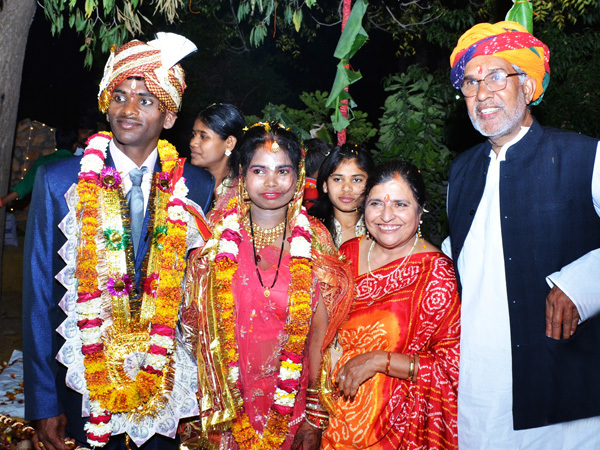 Bal Ashram hosted its very first Wedding ceremony in its premises. Bhadram and Sita, both spent years in Bal Ashram and after 11 years, they tie the knot on 25th March, 2016 in presence of all distinguished guests, Bal ashram staff and Bachpan Bachao Andolan Staff. The wedding was grand that was arranged by Bal ashram staff. 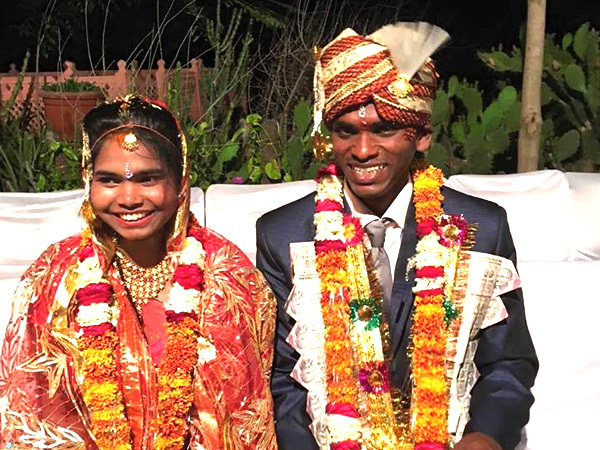 Mr. Kailash Satyarthi and Mrs. Sumedha Kailash both took care of these two youngsters like their own children and personally invited the guests to attend the wedding in Bal ashram. Bhadram was rescued by Bal ashram staff in 2005 when a local police official reported an incident of an injured boy being thrown off a truck in Virat Nagar. It was reported that the truck carried a Tamil Nadu number plate and the boy was physically abused with rods. When Bhadram was brought to Bal ashram, he was just 10 years old. First few months, were not easy for him to cope up and no one understood what Bhadram was trying to communicate as he spoke Telugu language ( native language of state- Tamilnadu) while other children were speaking Hindi. Soon, Bhadram started picking up the local language, started talking, playing with other boys. On the other hand, efforts to trace his family continued. The only history that could be established was that little Bhadram worked at a local dhabha in his native village and was sold to a truck driver by his employer, to assist him with his daily chores. Today, 11 years later, Bhadram is a happy, cheerful young man. He is a very talented dancer and enjoys gardening. He is a resident of the Bal Ashram and is helping other young boys with their healing journey. Everyone who visits Bal Ashram adores him a lot. On the other hand, Sita had a fierce childhood. She is from Assam. Her step-father was an alcoholic and would often beat up Sita’s mother which later lead to her death. When both her parents passed away, she started living with her aunt. Living in a poor household and being vulnerable, she became a victim of human trafficking in the year 2011. She was brought to Delhi. In Delhi, the trafficer sold her to a placement agency for Rs. 22000. She was placed at a household in Sonipat in Haryana as a domestic help where she was forced to work without any pay. In Sonipat, she wasn’t allowed to contact her family, and her employer often physically abused her. She was subjected to every kind of violence and abused by a vegetable vendor who had been stalking her for days. She was then completely broken and forced to even contemplate suicide. The rescue was very difficult because the local police was in connivance with the trafficker and the employer. With support from Haryana Police and BBA activist, Sita was rescued from Sonipat in 2013. Sita was brought to Delhi. Mrs. Sumedha Kailash embraced her and invited her to stay at her house. The BBA legal team fought her case on her behalf and got her compensation, minimum wages and recovered back wages, amounting to over Rs 3000,000. She went back home to Assam with her aunt. Her unfortunate ordeal didn’t end there. Most of her compensation was used up by her relatives. She again came to Delhi and has been staying at Mrs. Sumedha’s house like family ever since and now a happily married women.